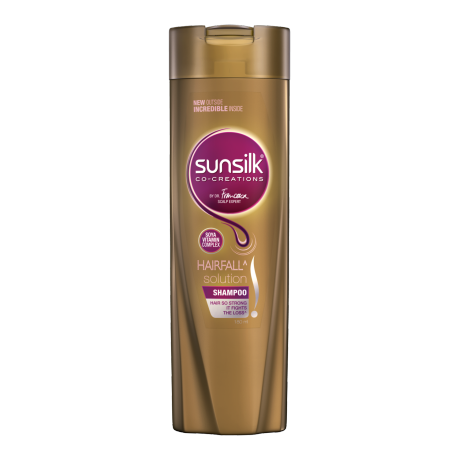 Sunsilk Hairfall Solution shampoo 180ml, for hair so strong it fights the loss! Sunsilk Hairfall* Solution Shampoo, is now New Outside & Wow Inside. 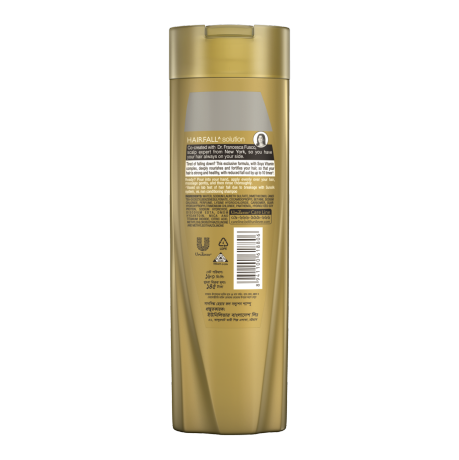 Its most joyful gold shampoo pack comes with an easy to handle grip and a wow inside as before. Sunsilk Hairfall Solution contains soya vitamin technology. The new formula complemented by a fresh perky fragrance works from the first wash, so your hair is reinforced and strengthened up to the tip. Tired of hair fall everywhere you turn? On your car seat, your pillow??! Stop frequent hair breakage and hair fall, starting today! You don’t have to put up with weak, fragile, damaged hair that falls everytime you touch, brush or comb it. Sunsilk Hairfall* Solution now helps your hair reduce fall out upto 10 times*. Water, Sodium laureth sulfate, Dimethiconol( and) TEA-dodecylbenzenesulfonate, Cocamidopropyl betaine, Perfume,Sodium chloride, Carbomer, Guar hydroxypropyltrimonium chloride, Lysine Hydrochloride, Panthenol, Hydrolyzed soy protein, Sodium hydroxide, Disodium EDTA, DMDM Hydantoin, MICA and Titanium Dioxide, Citric acid, Methylchloroisothiazolinone and Methylisothiazolinone.